I want to comment on two of the things brought up, both related to a member of the FCIC named Peter Wallison, who is also a fellow dealing with financial regulation for the American Enterprise Institute. He, along with another person named Ed Pinto, have been at the center of the campaign to blame the GSEs for the crisis. First off, let’s remember what this document is. The FCIC report was designed to be our age’s Pecora Commission, a collection and investigation of original documents and primary sources along with summary document that scholars, historians, economists and reporters will use for generations. It is designed for our government’s investigative powers to get to the bottom of what went wrong in the bubble and the subsequent crash. It was important that honest conservatives and libertarians were on this to provide balance and insight. The panel required serious scholars and investigators, those whose ultimate agenda and requirements were to the truth and the public. Think about this. Wallison is putting pressure on his fellow Republican members to write their FCIC report to serve the political ends of the Republican party and its backers in their legislative quests. Not goals of the public, which we as taxpayers were paying him at the level of a level IV of the Executive Schedule to do, a pretty nice pro-rated six-figure salary, and not the goals of disinterested research. This is the person who leads the financial reform team at the American Enterprise Institute. It seems silly to say now, but in the aftermath of the financial crisis I had expected more from movement conservatives on dealing with this nightmare. It’s been very disappointing. What interests me the most are how the other members of the GOP reacted to Wallison and Pinto’s thesis that the GSEs caused the financial crisis. I wrote a post that pointed out that the numbers don’t work, based on David Min’s (and many, many others) research into the matter. They do a three-card monte thing where they say “subprime and other high-risk mortgages,” bundling the well known category of subprime alongside their new definition of “high-risk”, and then play on the confusion. Push-comes-to-shove I’m a numbers guy, and I can tell when someone is creating a definition not to make something clearer but instead to make it harder to understand and compare while juking the aggregate statistics. For pointing that out I got two responses referring to me as deceptive and ignorant from that crew. But the echo chamber marches on: The American Spectator runs stories on this, communication budgets go towards getting these arguments into editorials, TV appearances, conferences, the radio shows, etc. Bill spoke to Phil [Angelides] and Wendy [Edelberg, Executive Director] and gave them his thoughts. Doug [Holtz-Eakin, Commissioner] was around the office today, so Bill looped him in and I explained to Doug what was going on. Doug said that he has some experience dealing with an intractable Peter before. Everyone agrees that there is simply no way to make Peter happy re: these staff reports. However, hopefully, we can keep him engaged enough so that when the time comes, we can sit down and have a reasonable conversation about the most effective way to describe the mortgage market. Wendy is going to reach out to Ed Pinto, and, hopefully, if we can get Ed to sign on, then Peter will really be sitting alone on this one. My guess is that the best we are going to do is to get Peter to agree that he really can’t say anything until we get all of the data in front of us and that the data is coming. At that point, this debate over what kinds of mortgages are out there will be a little more public, since the FHFA is coming out with a report that discusses the loan performance of their loans in the next two weeks (apparently, they are trying to beat us to the punch). And, this conversation really doesn’t need to happen until September, so we can all cool off from these hysterics and worry about other things for a little while. Then, Peter is going to have to sit in a room and tell everyone why his way is the best way to describe the universe. Re: peter, it seems that if you get pinto on your side, peter can’t complain. But is peter thinking idependently [sic] or is he just a parrot for pinto? I can’t tell re: who is the leader and who is the follower. If Peter is really a parrot for Pinto, he’s putting a lot of faith in the guy. Pinto called tonight, and Wendy scheduled call with him for tomorrow morning. I am going to sit in on the call (quietly). I want to get a sense of whether this is a strategy that we really can use, or whether Pinto is just like Peter. Maybe this email is reaching you too late but I think wmt [William M. Thomas] is going to push to find out if pinto is being paid by anyone. Wallison’s argument is the argument for the conservative right on the crisis, echoing through their networks. Yet behind closed door the Republicans on the FCIC are in damage control mode. They can’t find a way to deal with Wallison and this argument and they are actively working to play him and his research partner against each other. They are even so confused as how someone could buy the entirety of this argument that they are worried that it was planted by a paid interest and that their fellow member is a “parrot” for those interests. The Republican Vice-Chair might even have done some quiet snooping to get a sense of what is going on. The Republicans in the main dissent throw the argument under the bus in a subtle way, but never mention the Pinto/Wallison thesis by name (the majority report does). That way the echo chamber can keep on spinning with this argument. And spin it does. That’s a pretty serious disinformation operation. It’s funny to see Alex Brill wondering if someone else got paid to produce a result. Three years ago Brill was being paid by the down payment assistance program scammers to defend no down payment mortgages. Nice link to the AEI! Or is it the usual case with them that they expunge webpages right and left. This surprises you? The GOP has been acting like this for some time now. They do whatever ALEC, AEI, Heritage, Limbaugh, Faux Noise and the Koch Brothers tell them to do. I think you may have the relationship backwards- I think that while the media (and wealthy donors) may lead the conservative movement, that the think tanks largely provide post-facto intellectual cover for pre-existing positions. Perhaps I could be wrong, but that is the way I’ve always seen the relationship. I think you may have the relationship backwards- I think that while the media (and wealthy donors) may lead the conservative movement, as opposed to the think tanks which largely provide post-facto intellectual cover for pre-existing positions. Perhaps I could be wrong, but that is the way I’ve always seen the relationship. Heh, it popped up my first reply when I tried to correct my terrible grammar. I thought you finally had an editing feature. Apparently not! In about 2002 a group of prominent Wall Street firm realized that aggressively packaging up individual mortgages into Collateralized Debt Obligations (CDOs) and quickly reselling them to investors would generate tens of billions in revenues. This CDO ponzi scheme required two key players. 1)	Independent Mortgage Companies: Wall Street partnered with and funded independent mortgage companies like New Century Mortgage and Option One (who were not FDIC member institutions and thus not subject to many of the federal regulations that prevent predatory and other risky loan practices), or segmented subprime divisions of Savings and Loans such as Countrywide and IndyMac Bank, to issue sub-prime mortgages in order to feed the CDO conveyor belt. These subprime mortgages required the borrower to pay higher interest payments over the long term, which was preferred by investors as they received a higher yield. To create the needed high volume for these CDOs, mortgage brokers were incented to issue subprime loans to basically anyone who walked in the door. 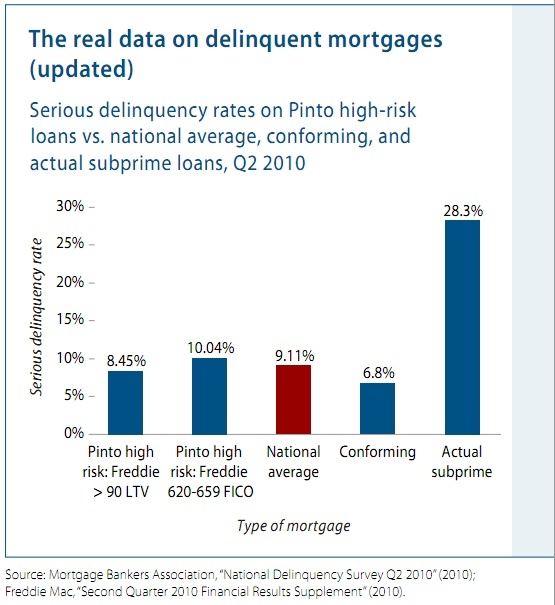 Additionally, many borrowers with good credit who would have qualified for traditional prime loans with lower fixed rates were deceptively steered into subprime one as Wall Street paid much higher commissions to the mortgage brokers for subprime paper. As the mortgage brokers and Wall Street made their money on the front end of these transactions and had no intention of holding these loans for any extended period of time, they harbored no concern whether these folks could ultimately repay these loans. According to the FDIC From 2002-2007, the vast majority of problematic subprime loans issued by independent mortgage companies were bought up by Wall Street another investors, not the GSEs. 2)	Credit Ratings Agencies. The only way for this Ponzi scheme to work was for Wall Street to essentially buy off the likes of Moodys and Standard and Poor. And that is what they did, resulting in bogus AAA ratings to this toxic soup of CDOs, thereby misleading scores of investors to the tune of trillions of dollars. The credit ratings enjoyed freedom and liberty from the evils of reasonable regulations which allowed for them to crash the global economy in exchange for some short term profits. Eventually of course, the housing market ran out of steam, causing the whole house of cards to come crashing down. I’m just sitting here wondering why the judicial branch of our government hasn’t been approached by some type of citizens group, to investigate this entire matter and hold the criminals responsible. Class action suits against the Wall Street, I say again, CRIMINALS that benefitted from this premeditated financial conspiracy to defraud, not only the public at large, but also make it look like the government wasn’t doing their job? They knew it was unethical at the very least and obviously also illegal, as we’re now finding out, because of their attempt to cover up their lies and wrongdoing. Why have they been allowed to slither away with their ill-gotten gains mostly intact? DC seems to be asleep at the wheel, when it comes to this. All talk, no action. Oh, yeah, give them TARP. Those bankers sure are smart! Pardon me, slick. 5. Hope that your complaint about the looting and pillaging of the state and federal treasuries since 2007 results in a judgment in favor of the one who prefers accusation (that’d be you) against suspected person or persons (that’d be the .gov/banking cartel). Let me know if you’d like any help crafting the complaint.